Why have the mental illness and mental disorder rates increased in recent years? Is it the food we eat, or just as important, the food we don't eat? 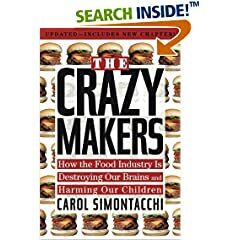 According to Carol Simontacchi and her book "The Crazy Makers: How the Food Industry is Destroying Our Brains and Harming Our Children" it does. This book not only attacks the food industry for putting chemicals and toxins into our food, but shows us as shoppers, wives, moms (and dads!) how we are starving our brains with foods that have no nutrition and chemicals that can have damaging effects. I like the way this book is set up as it starts at the very beginning of life with a chapter for pre-natal nutrition, moving on to infant nutrition, kids, teens and finally adults. I think this book would be especially beneficial for those parents that have children who are chronically sick or unruly children doctors want to medicate, as she shows different ways that kids can have food sensitivities that doctors don't check for.